It has been announced this week that CS Wind UK is to build the UK’s first offshore wind tower manufacturing facility alongside their existing plant at MACC Business Park. CS Wind is to build a new offshore tower manufacturing facility as a result of a multi-million pound investment from Danish firm Dong Energy. The investment will give Dong Energy preferred access rights to towers for its offshore windfarms. 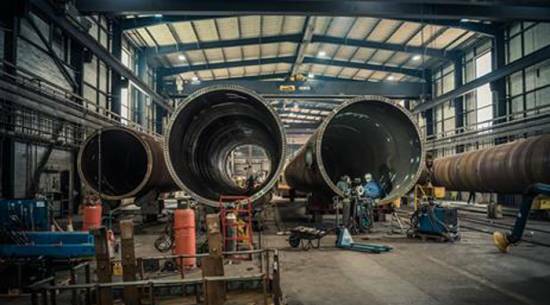 The new facility will be the first in the UK that can manufacture towers for offshore wind turbines and will be located adjacent to CS Wind’s current onshore wind tower factory here at MACC Business Park. It will be able to produce at least 50 towers a year and 70 jobs will be safeguarded as a result. The investment will enable the contract for the first 95 towers built by CS Wind, which Siemens Wind Power has agreed to take, and will help in the establishment of a tower manufacturing facility in the UK.